When you walk among this charming part of Barcelona known as the Barri Gotic, or Gothic quarter, it can feel as if you are walking among history. November 2014, panorama from 3 vertical images, additional exposures for highlights, focal length 16mm, aperture f/11, exposure 3.2 seconds, ISO 100, tripod. However, according to a recent paper by Agustin Cocola entitled “The Gothic Quarter of the Barcelona: Planning the Past and Brand Image”, what me may be seeing is not all that authentic. According to the author, most of the downtown quarter of Barcelona was transformed from a dreary neighborhood to the marvelous architecture seen today in order to press the world for the 1929 International Exhibition. Real or not, this area of Barcelona, especially Placa Reial, is breathtaking. 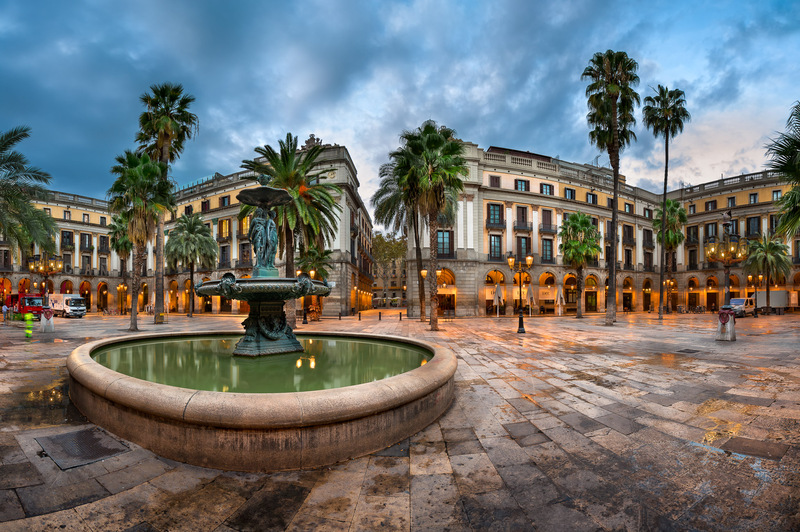 Placa Reial is a beautiful pedestrian square which is filled with luscious palm trees. Tons of delicious details, like the street lamps designed by Antoni Gaudi, made it a wonderful place to capture a photo. These may have been one of his first official order from the municipal of Barcelona. With so much to capture, I decided to focus on the Fountain of Three Graces, which represent three Greek goddesses who work in the realm of charm, beauty, and creativity. Trying different focal points, this was my favorite to capture the splendid beauty of fountain.